Do you remember when the AP’s college football poll was part of the BCS formula? Do you remember why the AP decided to remove its poll from the BCS? It was essentially because the AP didn’t want to make/create the news; they simply wanted to report it. In other words, the journalists who voted in the AP poll listened to their ethical side and (following a few controversies involving the BCS’ final standings) thought it would be best to recuse themselves from the BCS formula — thus removing any conflict of interest. Unfortunately, the same cannot be said for the USA Today / Coaches’ Poll.
. . . For the first several years [of the BCS] the AP Poll factored in the determination of the BCS rankings, along with . . . the Coaches Poll and computer-based polls. Because of a series of controversies . . . the AP demanded in December, 2004, that its poll no longer be used in the BCS rankings . . . . In the 2003 season the . . . final BCS standings ranked the University of Southern California (USC) at #3 while the two human polls in the system had ranked USC at #1. As a result, USC did not play in the BCS’ designated national championship game. After defeating another highly ranked team, Michigan, in its final game, the AP Poll kept USC at #1 while the Coaches Poll was contractually obligated to select the winner of the BCS game, Louisiana State University (LSU), as the #1 team. The resulting split national title was the very problem that the BCS was created to solve . . . . In 2004, a new controversy erupted at the end of the season when Auburn and Utah, who both finished the regular season 12-0, were left out of the BCS title game in favor of Oklahoma who also was 12-0 and had won decisively over Colorado in the Big 12 Championship game. USC went on to a win easily over Oklahoma in the Orange Bowl while Auburn and Utah both won their bowl games, leaving three undefeated teams at the end of the season. Also, in that same year, Texas made up late ground on California (Cal) in the BCS standings and as a result grabbed a high-payout, at-large spot in the Rose Bowl. Previous to that poll, Cal had been ranked ahead of Texas in both human polls and the BCS poll. Going into their final game, the Golden Bears were made aware that while margin of victory did not affect computer rankings, it did affect human polls and just eight voters changing their vote could affect the final standings. Both teams [Cal and Texas] won their game that week, but the Texas coach, Mack Brown, had made a public effort to lobby for his team to be moved higher in the ranking. When the human polls were released, Texas remained behind Cal, but it had closed the gap enough so that the BCS poll (which determines placement) placed Texas above Cal, angering both Cal and its conference, the Pac-10. The final poll positions had been unchanged with Cal at #4 AP, #4 coaches, and #6 computers polls and Texas at #6 AP, #5 coaches, and #4 computer polls. The AP Poll voters were caught in the middle because their vote changes were automatically made public, while the votes of the Coaches poll were kept confidential. Although there had been a more substantial shift in the votes of the Coaches Poll, the only clear targets for the ire of fanatical fans were the voters in the AP Poll. While officials from both Cal and the Pac-10 called for the coaches’ votes to be made public, the overtures were turned down and did little to solve the problem of AP voters. Cal went [to the] . . . Holiday Bowl. Texas defeated Michigan in the Rose Bowl. Many members of the press who voted in the AP Poll were upset by the fiasco and, at the behest of its members, the AP asked that its poll no longer be used in the BCS rankings. The 2004 season was the last season that the AP Poll was used in the BCS rankings. . . . The USA Today / Coaches Poll is apparently far too dependent on the readership and traffic that is generated by the administration of their top 25 poll to worry about withdrawing from BCS participation. I am willing to bet the USA Today executives know exactly how many subscribers and readers they would lose if they were to pull out of the BCS, and they are simply not willing to do that. In other words, USA Today is more concerned with its bottom line, than its journalistic integrity. In fact, USA Today is even willing to go a step further — they are willing to exploit their participation in order to create more news / content. Such exploitation increases traffic on their website and total readers of their newspaper. So where is all of this coming from? 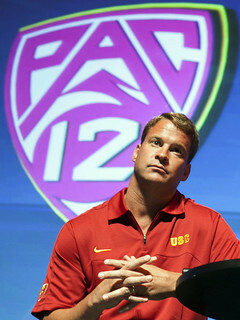 Well, in case you missed it, earlier this week USC head coach Lane Kiffin was asked if he voted USC No. 1 in the USA Today / Coaches preseason poll. Kiffin answered that he “would not vote USC No. 1,” but apparently he did. Despite being told by USA Today that the balloting was confidential, USA Today then turned around and almost immediately reported that Kiffin had lied about his vote. The subsequent fall out is that Kiffin has withdrawn from voting in the coaches poll. Creating their own news and thus making more money, is the only explanation as to why USA Today and the AFCA decided to release the confidential vote of USC’s head football coach Lane Kiffin. 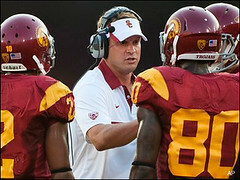 Kiffin’s misleading comments can be seen and heard in the video above. If the video doesn’t automatically start at the 5:45 mark, simply fast forward to hear what he said. You could easily make an argument that Kiffin was in an impossible situation. Upon being asked if he voted USC (his own team) No. 1, he could either say yes, no, or no comment. I can only imagine that answering the question with “no comment” would lead to the speculation that he did vote USC No. 1. While answering with a “yes,” would do the same, only it wouldn’t be speculation. In fact, answering with a “yes” would only lead to more questions as to why did he vote them No. 1, etc. Having to answer more questions as to why he voted USC No. 1 is not an excuse to lie, and I am not trying to make it one. However, Kiffin doesn’t really need a reason as to why. He had to pick someone and he felt that he needed to pick his own team. Coach Kiffin is pointing out that voting in a top 25 poll, while coaching a football team, can be a difficult task. How do you tell your players that they are the best and that they can beat anyone in the country, if you are going to turn around and vote them No. 2 or 3? Doing so would appear that you were lying to someone — either the team or to the poll in which you vote. It is for these reasons that I say Kiffin was in an impossible situation. Unfortunately, he opted to say that the wouldn’t vote USC No. 1 in the poll although he had apparently already done so. But have no fear Kiffin, your USA Today / Coaches Poll vote is confidential (see the above letter / quote from the poll administrators). Wouldn’t you like to see this letter that was originally sent to the coaches that promised confidentiality (see above)? I don’t doubt that it said what the USC spokesman says it did, but it would be great if someone would release a copy of the letter. If the letter doesn’t mention the caveat that Brent Schrotenboer mentioned in his article, then we have a big problem. Schrotenboer’s statement is essentially confirmation of what I suspected USA Today was doing — changing the rules when it benefits them. The rule is that a coaches vote is confidential, however, when Kiffin lied about voting USC No. 1, USA Today couldn’t help but think “what a great story this would make!” With that, the idea of confidentiality was set aside in order to make some news and generate some traffic (i.e. more profit). As news of this “outing” broke today, we called five division 1 coaches and asked for their thoughts. Some were head coaches, others were not; but unanimously said that they feel those administering the poll have lost all credibility. Nearly every single coach questioned why the AFCA and USA Today would go public with this information. Truth be told, if USA Today was really interested in protecting the integrity of their poll they would do as the AP did and simply remove themselves from participating in a major conflict of interest. The fact that they don’t, tells us enough about their real motives. Grant Teaff, executive director of the AFCA, confirmed he sent Kiffin a letter about the matter after being told about it by USA TODAY Sports. Teaff declined to reveal details about the letter. He said all coaches have the right to publicly talk about their vote if they wish. “They have a responsibility when they talk to be responsible for what they say,” Teaff said. Why in the world would Grant Teaff reveal the details of his letter that he sent to Coach Kiffin? My guess is that the letter was confidential. And two, Chris Dufresne of the LATimes.com wrote an interesting piece pointing out the conspiracy theories that are hiding behind all of this. USC and the coaches’ poll have a history — and it isn’t pretty. Former USC Coach Pete Carroll never voted — and maybe now you know why. The coaches, you may hideously recall, named LSU its top team in 2003 even though USC was its clear-cut No. 1 entering a Rose Bowl game it won. The 2004 BCS trophy, awarded by the American Football Coaches Assn., was later taken from USC in the wake of NCAA sanctions. The Associated Press, conversely, named USC national champions in 2003 and allowed the Trojans to keep their title of 2004. This entry was posted in Pac 12, Poll, Preseason, USC by Travis Normand. Bookmark the permalink.